NEW ALBANY, Ohio, April 3, 2019 /PRNewswire/ -- Commercial Vehicle Group, Inc. (the "Company" or "CVG"), (NASDAQ: CVGI), a leading supplier of fully-integrated system solutions for the global commercial vehicle market, announced today that it will participate in BAUMA MUNICH, a regional trade fair for industrial vehicle components, in Munich, Germany, April 8th - 14th 2019. A new occupant sensor with higher sensitivity specifications for driver comfort and safety. Dave Anderson, Product Line Director for Europe, explains "KAB Seating is a leading player, recognized by customers around the world for comfortable and reliable seating solutions since 1968. Our new generation SCIOX seat line builds on this heritage with a modular platform that supports multiple applications and seating configurations with fewer SKU's. Professional operators will appreciate the high style, covering materials, and all-day comfort demanded in agricultural and construction applications. We believe customers will find the SCIOX line takes high performance, durable seating systems to the next level." The new KAB Seating SCIOX line-up will be on display with a wide range of medium and large construction vehicle applications, alongside a selection of the existing KAB construction seats. 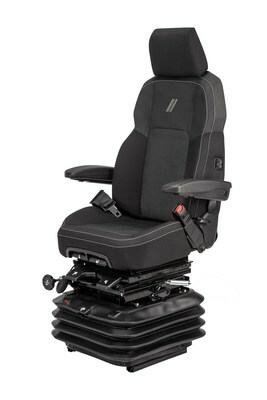 The SCIOX features increased levels of customizable options and styling to tailor the seat to the customer's preferences. KAB Seating will also be showcasing an Augmented Reality (AR) App which will bring the features of the SCIOX to life for visitors. Show attendees are invited to visit the KAB Seating booth located in Hall A6. Stand 245.